Jake Bushey tallied two assists in the overtime win at St. Olaf. NORTHFIELD, Minn. – The Gustavus men’s hockey team got retribution Saturday, defeating St. Olaf 3-2 in overtime one day removed from a 3-2 overtime loss to the Oles. The win is the first in the Minnesota Intercollegiate Athletic Conference for the Gusties as they improve to 2-11-4 overall and 1-6-1 in the league. St. Olaf took a 2-0 lead in the first period, scoring a power play goal a the 7:48 mark and then an even-strength score with 1:14 left in the frame. Shots were even 9-9 after the first 20 minutes. The Gusties outshot the Oles 11-4 in the second but were unable to find the back of the net and the home squad carried a two-goal lead into the third. The Gusties got a power play opportunity at the 3:35 mark in the third period and took advantage a minute in to the man advantage as Colin Hernon (Jr., Bloomington, Minn.) scored his fourth goal of the season, assisted by Joe Lindberg (Sr., Excelsior, Minn.) and Jake Bushey (Jr., Duluth, Minn.). Five minutes later, Bushey found Lindberg for the equalizer. Bushey now has 13 assists (3rd/MIAC) and 16 points (7th/MIAC), both marks that lead the team. 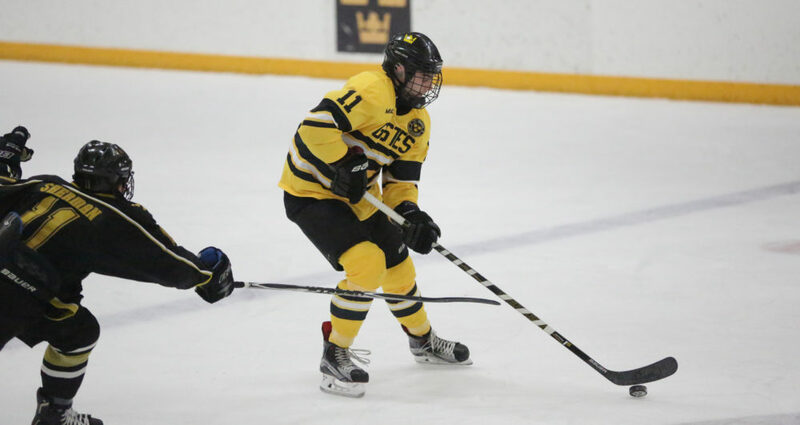 Halfway through the extra period, Evan Erickson (So., Woodbury, Minn.) found the back of the net for a team-best seventh time this season, giving the Gusties their first league win of the season. Erik Johnson (Sr., Sauk Rapids, Minn.) got his second straight start in net for the Gusties and earned the win after making 20 saves. Gustavus next travels to Concordia next weekend for two games in Moorhead, Minn.
Great game for Gustavus…on to more victories..